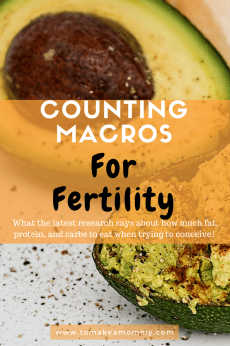 When trying to conceive and have a healthy pregnancy, there are many choices we can make every day to increase our fertility. 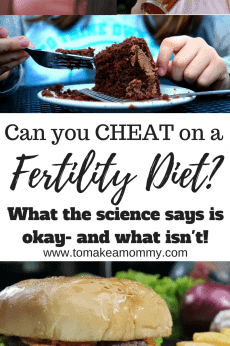 One of the most important is to avoid fertility-harming toxins and chemicals, such as phthalates, that are linked to infertility, pregnancy complications, and miscarriage. 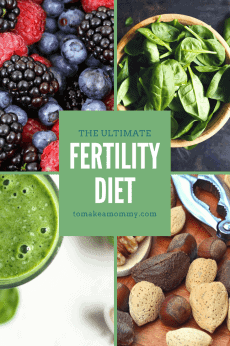 For my full overview of fertility-harming toxins click here! Phthalates are synthetic chemicals that lurk in plastics and many cosmetics, including perfume, cologne, and anything with synthetic fragrance. They are endocrine disruptors- this means that they wreak havoc on your hormones. 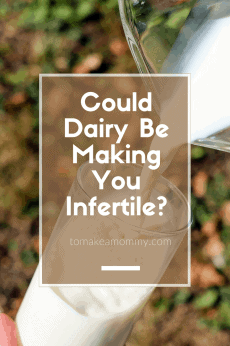 Not what you want when trying to conceive! Phthalates are linked to decreased fertility in men and women, miscarriage, and pregnancy complications. Phthalates are also linked to an increased risk for breast cancer, and to interruptions in the normal development of the fetus and of small children. They can disrupt the genitalia development in baby boys and are linked to ADHD and other behavior and learning issues in children. Are you convinced? I hope so! So, here’s the problem. Of the many places that phthalates lurk, synthetic fragrances are some of the worst. They are in every product that says “fragrance” or “parfum” and doesn’t specifically designate itself as natural fragrance or phthalate free. Start right now- go through all of your products and throw away anything with fragrance or parfum listed as an ingredient. And definitely throw away any perfumes! Make sure your husband throws away and cologne as well. Don’t forget to check your deodorants, and switch to an unscented variety (This is my non-toxic favorite). While you are at it, be sure to check your household cleaners, your laundry detergent, your hand soap, your shampoo, your hair products, your your moisturizer, your body wash, etc. Throw it all away and from now on only buy things without phthalates! Now, there are non-toxic fragrance alternatives, most of which include essential oils. 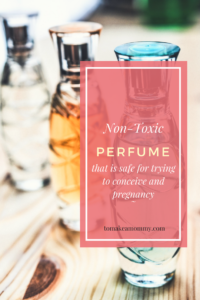 Please be very, very responsible when selecting a non-toxic fragrance. Essential oils are strong medicine, and you don’t want them interfering with your natural hormones and cycle. There are only a few essential oils I feel comfortable with using while trying to conceive (listed below). If you want to make your own perfume, just order some dark glass roll-on applicators from amazon, a safe carrier oil like sweet almond, and your essential oil. Now, some people get crazy about essential oils- saying their brand is the only “pure” one. Don’t believe the hype. All you really need to do is make sure the label says 100% pure, and not blended or diluted with an oil like jojoba or almond. Here is a nice blog on finding high quality essential oils. I’ve used Mountain Rose Herbs, Now Foods, Aura Cacia, and the Whole Foods 365 Brand, and I’ve liked them all. Plant Therapy is also a good, reasonably priced brand. Geranium– Some sources claim this essential oil balances hormones and can help regulate a cycle. It is also known to be calming and potentially helpful with endometriosis. It also smells good. It is safe for pregnancy, so no worries using it during the two week wait. Clary Sage– Some sources say that this oil can help regulate hormones, boost the libido, and help with male infertility as well. 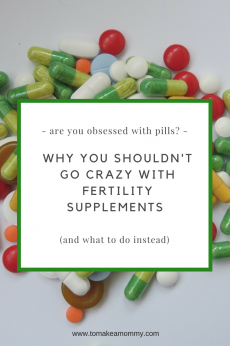 While some sources say this is safe for pregnancy, I have seen one source that suggest avoiding it due to its ability to bring on contractions. To stay safe, I’d only use it during the first two weeks of your cycle. Rose otto: I love this scent! It may help relax your womb, regulate your cycle, improve cervical mucous and improve your libido. It is not safe in pregnancy, however, and so not recommended after ovulation. This one is so expensive that you’re either going to have to buy it in a very small container, or buy it slightly diluted with jojoba or almond oil to have it be affordable. Any citrus oil- Lemon, Grapefruit, Mandarin Orange, etc. Citrus scents are lovely in a perfume and can help make you happier. 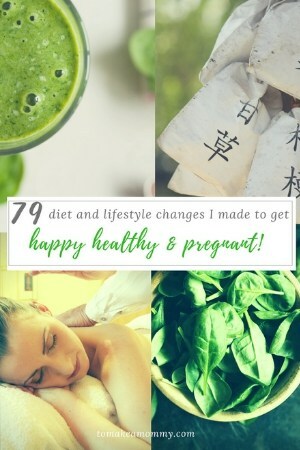 Get more happy, get more fertile, that’s what I say! Some sources say they can help support a healthy liver and lymph system as well. These are safe during pregnancy, and so can be used all cycle. You can also use these oils for all sorts of DIY non-toxic cleaning! They are also affordable, so buy a big one! 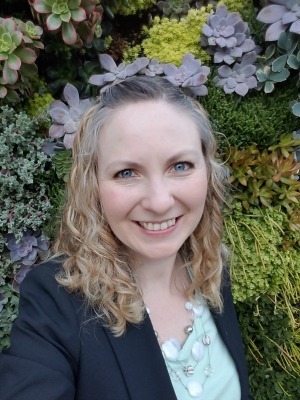 Now, if you are super excited about the idea of essential oils and fertility, check out this cool website on essential oil cycling where the author has devised a follicular phase oil for supporting estrogen (includes clary sage, fennel, coriander, geranium, frankincense, and ylang ylang), and a luteal phase oil with thyme, marjoram, geranium, frankincense, and ylang ylang). I’ve never used it before, but I love the idea! I’m a little concerned about the use of fennel and thyme oils, but that could be me being overly cautious. If you try it out, let me know how it goes! 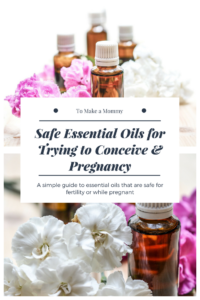 If you want to experiment further, here is a list of essential oils that are generally considered safe when trying to conceive. Only the ones that I have used are above. Some of these may be good for a personal scent/perfume, some may not. I wouldn’t walk around with Eucalyptus on, personally. Research each before using them and always get the guidance of a doctor if you have any concerns. 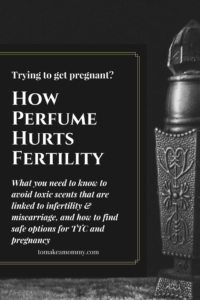 Safe Essential Oils for TTC & Pregnancy: Bergamot, Chamomile, Cypress, Eucalyptus, Frankincense, Geranium, Grapefruit, Lavender, Lemon, Mandarin, Neroili, Patchouli, Petigrain, Rosewood, Sandalwood, Tangerine, Tea Tree, and Ylang Ylang. Instructions: Put them in the roll-on bottle, and boom! You are done. You can play with the ratios to find what suits you, but only go lighter on the oils, not heavier. 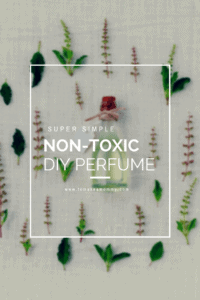 Want to buy non-toxic perfume? If you prefer a fancy pre-made bottle, I get it. Go to the Environmental Working Group’s Skin Deep Database. This is a terrific resource that ranks most cosmetics by level of toxicity. I try to only buy EWG Verified products. If those don’t exist, then I chose a product with no higher than a level 1 or 2. In another browser open up Amazon. On Skin Deep, use the drop-down menus to go to the category I want, say “Fragrance for Men,” or “Fragrance for Women.” If it’s me, I then see if any of the EWG Verified brands are on Amazon. Why? Because I hate trying to source random fancy cosmetic brands from elsewhere. Also, I am addicted to Amazon Prime and it’s free shipping, so I prefer to buy through them when I can. I know, not very “local,” but it sure makes life easy. Everything has to be a balance, right? You should feel free to spend time sourcing from other locations, or buying directly from the manufacturer if that is a possibility. I found only ONE EWG verified fragrance available on Amazon, and it is Qet Botanicals Nectar. It comes in Jasmine, Lavender, or Rosewood. It is so expensive though- I would totally just make my own if I were you! There are only a few EWG level 1’s or 2’s that look interesting to me and are on Amazon. One is the Ecco Bella Eau de Parfum in Bourbon Vanilla and the Ecco Bella Eau de Parfum in Ambrosia. EWG mentions a Lemon Verbena which I would love, but it isn’t available on Amazon. The Sarabecca Perfumes look lovely too and come in Vanilla Spice, Amber Blossom, Floral Citrus, Rose, Neroli and Patchouli (for you hippies :-). Always double check all ingredients to be sure they are safe for trying to conceive and pregnancy! I might just have to get myself a gift! Good luck, and may you be synthetic fragrance free and low in phthalates!